Buy the Farm . 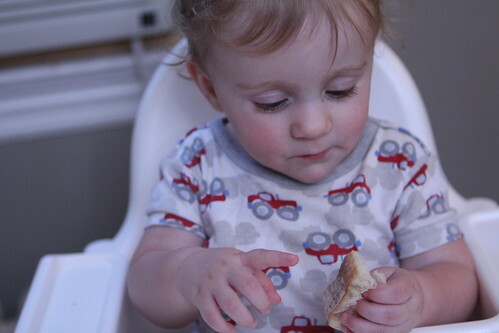 . . Share: Say, "Uncle!" For the past month Jen and I, as well as the Wombats, have been engaged in an all out battle against our every-swelling inventory of fresh lettuce. It is certainly my least favorite time of the farm year. I have had very little leafy greens that have truly excited me over the years. Last year I did have some incredible sorrel and arugula in Austin, TX. I would have happily eaten entire plates of either with absolutely no accompaniment. However, this is the exception to the rule. In general greens are a little boring. 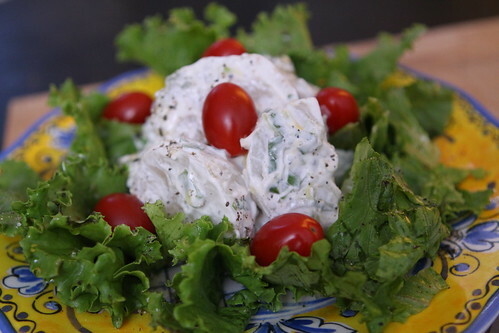 On Friday I used some of the Tropicana lettuce and topped it with kohlrabi which I boiled, chilled, and tossed with sour cream, salt, pepper, scallions, and a splash of hot sauce. 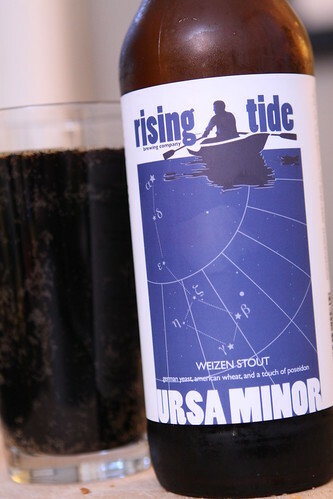 I also bused open this Ursa Minor Weizen Stout from Rising Tide Brewery in Portland, ME. I picked this up on my recent trip to Rhode Island and it was quite enjoyable. 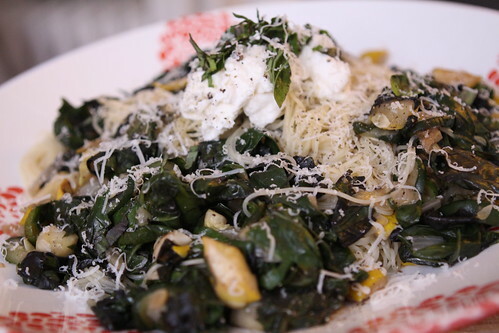 For the main course I used up the remaining summer squash and spinach along with onion, garlic, olive oil, salt, pepper, lemon, basil, and butter. 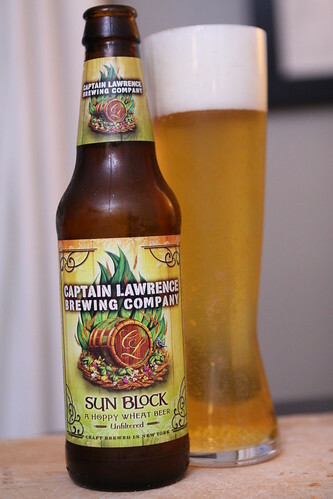 Jen had another wheat beer at the other end of the spectrum, this Sun Block from Captain Lawrence Brewing Company. This was another really nice offering from Captain Lawrence. On Saturday morning the Wombats were able to use their toy drum from Aunt Lauren and the Xylophone from Jen to start a pretty awesome new band. 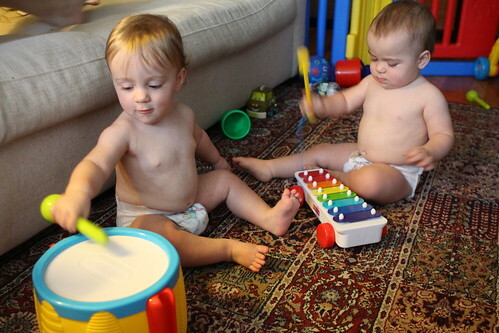 Baby Hit Parade magazine has called them: "The White Stripes with a xylophone." The xylophone is really weird in that it's like some sort of mixolydian scale. I think that's what Martin is going for though. Major keys are so played out. For lunch they had their first straight milk. The verdict: they're on the fence. 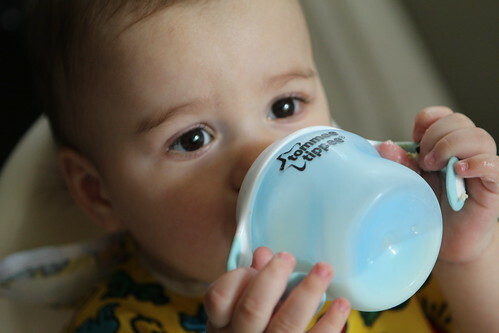 I think we've lost a bit of their trust after giving them something that looks just like formula but is not formula. 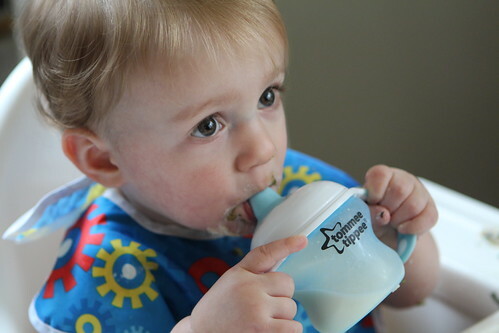 Milk is the main ingredient in formula so it's a little surprising that they don't like it. I guess once you get used to something as disgusting as formula it's hard to go back. 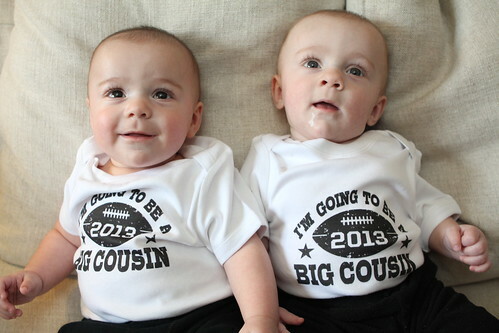 At Christmas Aunt Lauren told us that she was pregnant and we made an elaborate announcement for Grandma and Grandad where we dressed up the guys in T-shirts announcing the arrival of their first first cousin. Grandma opened this gift and was delighted by it but made no mention of the fact that her daughter was pregnant. Apparently she just thought it was some random, framed picture of her grandsons and did not read the T-shirts. On Sunday Aunt Lauren gave birth to Evelyn! 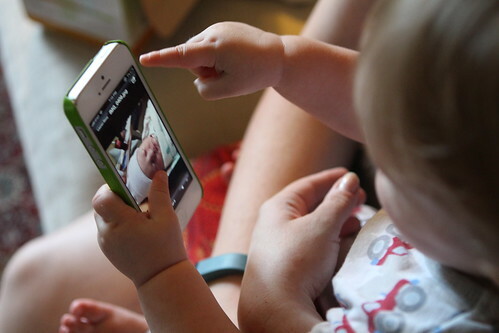 Martin was very excited to see her picture on Jen's phone. Elliott, however, saw the picture late as he was preoccupied with his afternoon nap. I had planned a French(ish) dinner to celebrate Bastille Day but how was I to know that I would also be welcoming into this world my first niece? Had I known I would have tried to plan something more thematic for that occasion. Of course, I can't imagine what that would be. 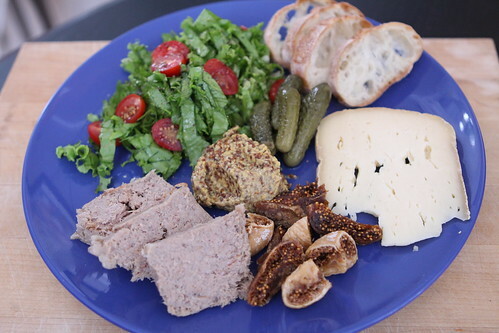 I started off with duck rillettes, a salad with Tropicana lettuce and lemon vinaigrette, whole grain mustard, cornichons, Turkish figs, and Bethmale cheese. I wasn't able to find a cheese from the Rhone-Alpes region of France (where today's Tour de France stage was being held) so I went with the mountainous region on the other side of France. That, at least, shows that there was some thought there. 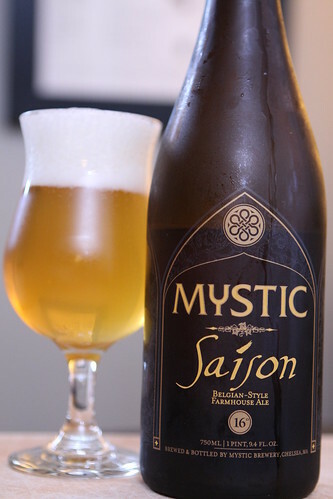 I also did not have a French beer so I went with a French(ish) beer, this Saison from Mystic Brewery. It was great, perfect for the season and the meal. And it was in a Belgian style. I've heard that that's near France. 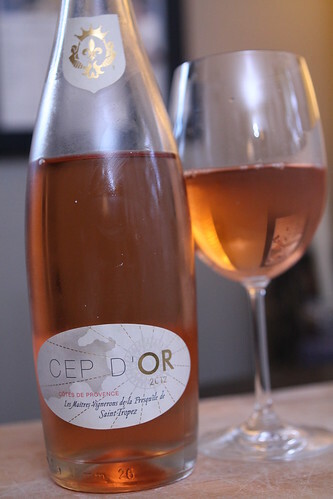 Jen had this Cep d'Or rose which was also very tasty and also very much not from the correct region of France. It was closer than my cheese so that was a plus. You can see here that I was not going to let go of my absurd need to try to pigeonhole this dinner into the Rhones-Alpes region. Even though I had next to no food or drink traditional to that area. 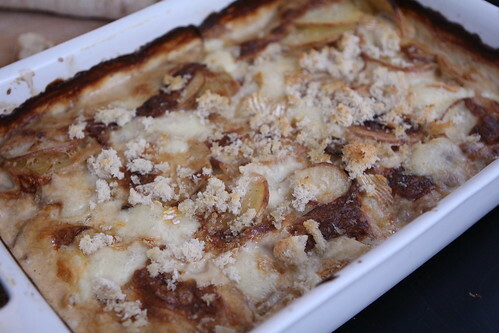 For dinner I made tartiflette which is a traditional dish from the region. It's basically like a potato Dauphinoise with cheese, onion, and bacon added. I cooked some onions in rendered bacon then added in the sliced potato, cream, milk, salt, and pepper and cooked it all in the oven. When it was almost done I put in some chunks of Saint Albry cheese. I should have used Reblochon but, again, there was none available to me. The end result, as you could probably imagine, was quite delicious. The Wombats celebrated by eating (but mostly destroying) a baguette. A mere year and six days after the Wombats made their entrance their cousin joins them. That's much more exciting than some French people storming a crummy old jail. This is America where Canadians give birth to Americans, son! I think you mean, "Where Canadians give birth to Canadian-Americans, son"! I think I mean, "Don't front on my stylo, Holmes!"